It started with the basic thought “We can do better”. 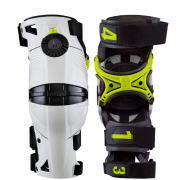 After it was done, we had developed a revolutionary new concept in rider knee protection. After seven extensive years of development, several generations of prototypes, and months of testing with bio-mechanical engineers, industrial engineers, and an orthopedic surgeon. Worn by one of the best riders to ever do it after a previous accident, you can rest assured knowing that your knees are in good hands.